This page contains some World Record information for various Circus Skills props. Most diabolo catches in a minute is 16 times. The diabolo had to be thrown a minimum of 6 metres high each time. Record held by Zheng Da Zong Yi in 2007. Most people tossing a diabolo in the air at the same time is held by Manor Primary School in the UK. 223 people! The year was 2008. Most Spins on a Unicycle in 1 minute (127 spins)! Achieved by Machiko Ashida from Japan in the year 2010. Longest Jump on a Unicycle is 2.95 metres (9ft 8 inches). This was achieved by David Weichenberger in the year 2006. Most stairs climbed on a Unicycle (without any part of his body touching the ground) is 670 stairs. This was done at the Eiffel Tower in Paris (so they would have eventually ran out of stairs for him to climb! Achieved by Benjamin Guiraud in the year 2006. Most tea cups (and saucers) caught on top of a head whilst riding a tall unicycle goes to the legendary Rudy Horn. This record is from way back in 1951. For approx 20 Unicycling World Records, you can find them on the Guinness World Records website (do a search for “Unicycle”). Most people spinning plates simultaneously is 1026 people! This was achieved at the opening of the SportCampus in Utrecht in 2007. Most dinner plates spun on poles by one person is 108 plates. This is held by The Great Davido. Most pen spinning fingerpasses in 1 minute is 66. This was achieved by Daniel Muss in the year 2009. For more records, head on over to the World Sport Stacking Association website. 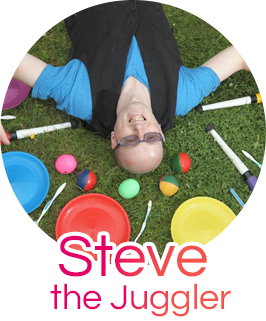 If you know of any more World Record Juggling facts for these or any other Circus Skills props, then please fill in the form at the bottom of the page. If there is video footage of the World Record attempt then let me know!